This portrait of Goyathlay (aka Geronimo, Spanish for Jerome) was taken by Ben Wittick in 1887, after the Apache leader’s third and final surrender and deportment to Florida. Goyathlay led the last Native American fighting force to formally surrender to the United States, after nearly 30 years of fighting against Mexican and American troops. His daring raids, numerous escapes, and ability to evade thousands of troops for decades made him one of the most famous, and feared, Natives of the time. Goyathlay (“One Who Yawns”) was born in 1829 to the Bedonkohe band of Apache near Turkey Creek, in the Gila Mountain region of what is today New Mexico, but was then still Mexican territory. Goyathlay was not a chief, but after marrying into the Nednhi band of Chiricahua Apache he became a spokesman for their chief, his brother-in-law Juh, who had a speech impediment. As a result, he was often mistakenly assumed to be the leader by outsiders. In 1858, while the men were in town trading, a company of Mexican soldiers attacked their camp, slaughtering the women and children who were there. Among them were Goyathlay’s wife, children, and mother. The tragic loss of his family left Goyathlay with a lifelong hatred of Mexicans—and, to a lesser degree, all white people—and thereafter he made it his mission to kill as many as possible, attacking and terrorizing Mexican settlements whenever he could. In 1876 the Chiricahua were forcibly removed by the U.S. Army to the San Carlos Reservation in eastern Arizona. Goyathlay and a group of followers escaped and fled to Mexico. Eventually they were captured and returned to the reservation, but in 1881 the murder of an Apache prophet prompted another escape. Goyathlay, Juh, and others resumed their attacks from a base in the Sierre Madre Mountains in Mexico, where U.S. troops could not follow. However, in 1883 the Mexican government allowed the U.S. Army into Mexico. With the aid of Apache scouts, the mountain strongholds were located and the Apache bands were killed or captured. Goyathlay was once again returned to San Carlos, where he remained until his final breakout in 1885. With a small band of 38 men, women, and children, he evaded capture for over a year. Over 5,000 American soldiers—a quarter of the entire army—pursused them, along with 500 scouts and 3,000 Mexican soldiers. At last, worn down by the constant pursuit, Goyathlay surrendered for the final time in September of 1886. The survivors were held briefly at Fort Bowie, Arizona, and then shipped off to Fort Sam Houston in San Antonio, Texas. They were held there for about six weeks before being sent on to Florida, where the rest of the Chiricahua had already been exiled. During their time in Florida, hundreds of their children were taken from their families and sent to the Carlisle Indian Industrial School in Pennsylvania, where more than a third quickly died from tuberculosis. Many of the prisoners in Florida also died from disease and neglect. In 1888 the Apache were relocated to Mt. Vernon Barracks in Alabama, where another quarter of the remaining population died of tuberculosis. Finally, in 1894, they were relocated yet again to Fort Sill, Oklahoma, where they were given plots of land to farm. Goyathlay died there of pneumonia in 1909, still a prisoner of the United States, never having been allowed to return to his homeland. It is said that on his deathbed he told his nephew, "I should have never surrendered. I should have fought until I was the last man alive." 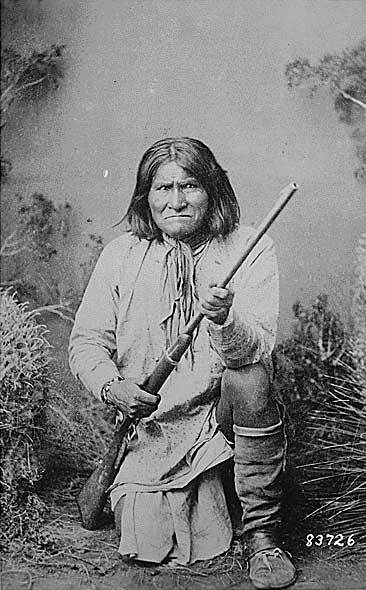 Image Source: "Geronimo (Goyathlay), a Chiricahua Apache; full-length, kneeling with rifle." (530880); digital images, "Record Group 111: Records of the Office of the Chief Signal Officer, 1860 - 1985," U.S. National Archives and Records Administration, National Archives Catalog (https://catalog.archives.gov/id/530880); crediting "Ben Wittick."